So it’s that time of the year again, the time of the egg battles. Growing up, I have to admit, the egg taping contest was my favorite thing about Easter. 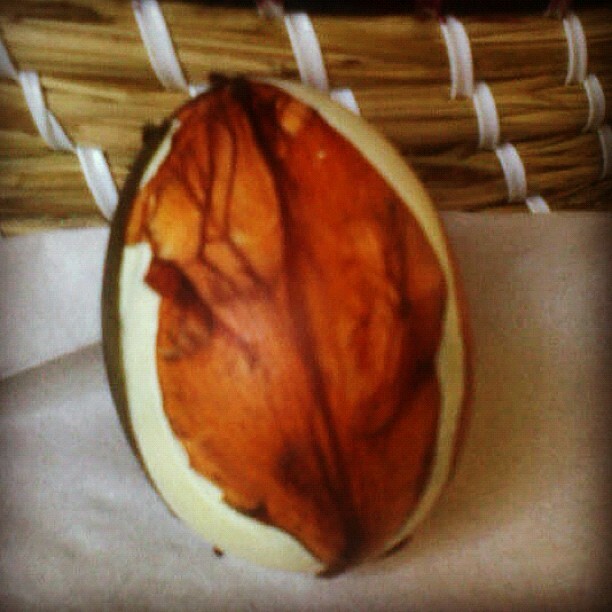 My mother was always very good at picking the winning egg. It had to be small, dense and slim. All those who were unlucky enough to be left with the big fat eggs were sure to lose. 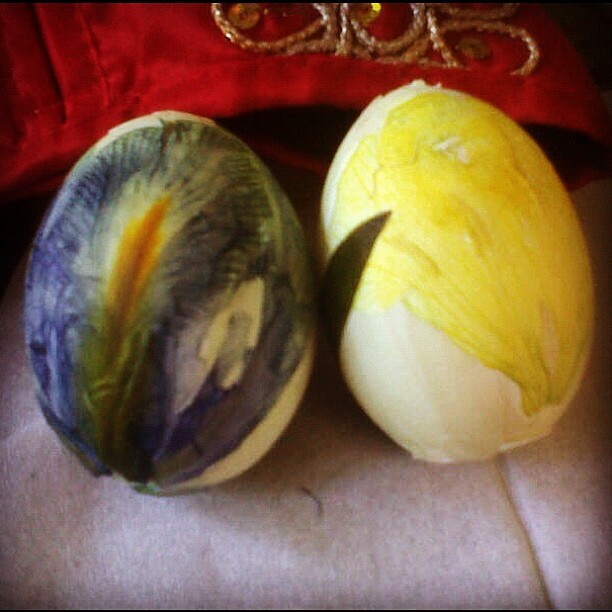 My second favorite thing was decorating the eggs themselves. 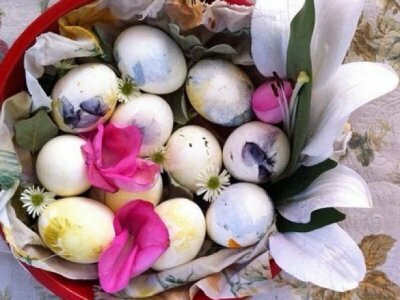 After years of fluorescent artificial coloring and Easter rabbit stickers, my mother reminded me that when we were little she used to decorate the eggs with real flowers. 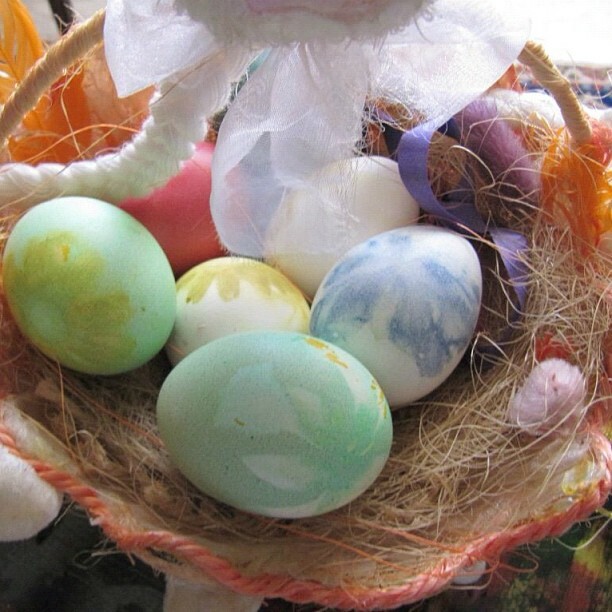 Easter eggs are not only decorated to celebrate Easter, they also represent spring time. 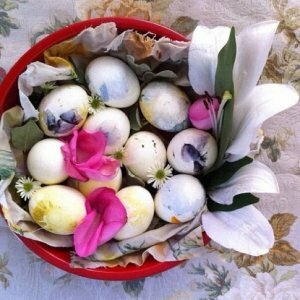 I had no memory of these flower decorated eggs so I asked her to show me how to make them. First things first: You’ll need to go out in Nature and pick a few flowers. For more esthetically pleasing result I would suggest you go for diversity. 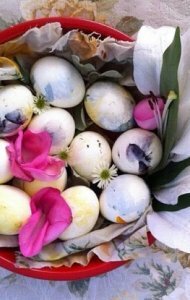 The leafs will also print on the eggs so keep them on the stems of the flowers. Don’t go to the florist and buy tulips or roses. The consistence of the petals is essential to the success of this exercise. If you feel like the petal is coated then you’re better of without it. Go for flowers with fragile petals (poppys, daisies…). Also don’t forget to buy eggs. White eggs are a better support for this exercise. 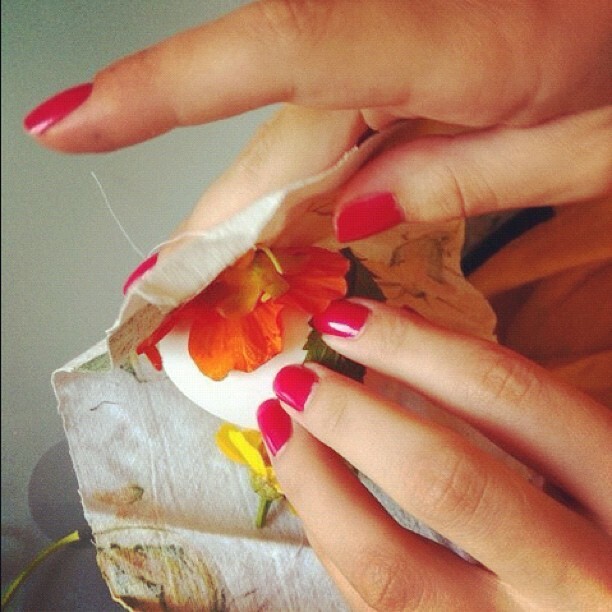 Find an old piece of cotton cloth that you no longer need and cut it into pieces big enough to wrap the eggs in. 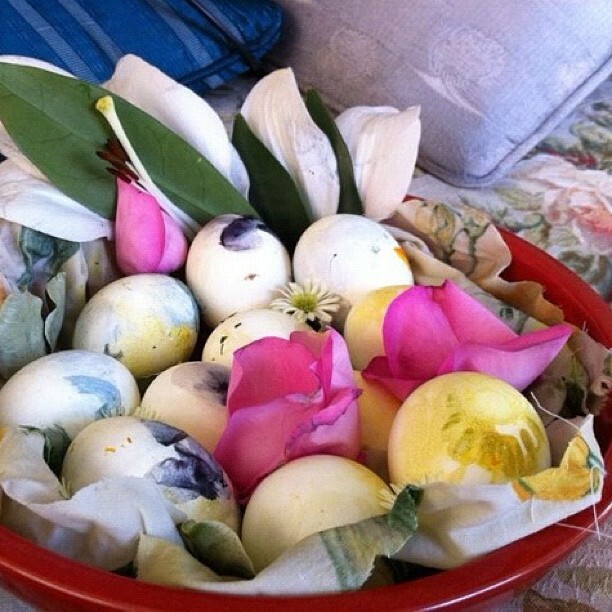 Place the flowers and leafs that you have picked all around each egg and wrap them in the individual pieces of cloth. Secure the cloth in place by going all around it with a sewing thread and tie the thread’s loose ends. 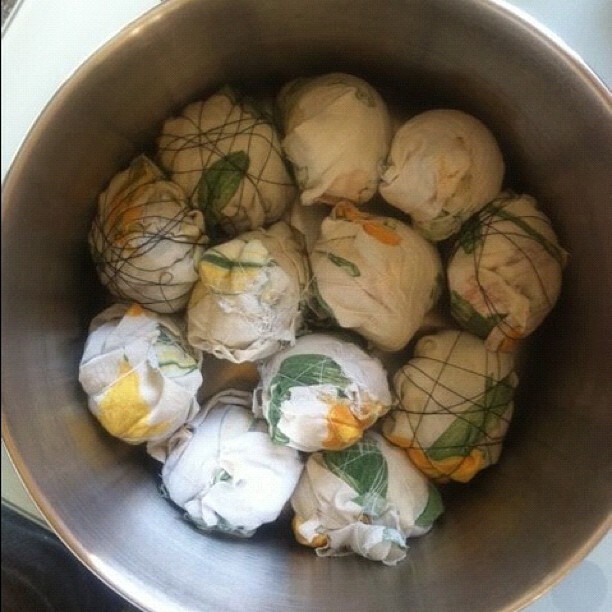 Place your wrapped eggs in a pot, add water, and boil them for 8 minutes. 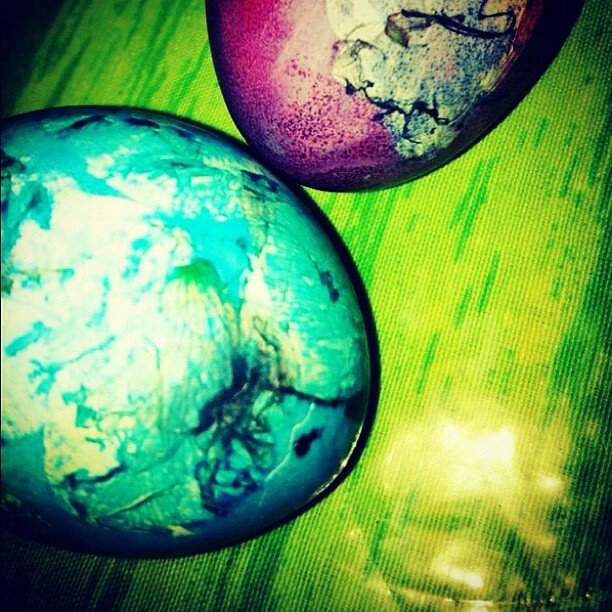 And there you have it, beautiful natural Easter eggs. Soussane used lilies and tulips. She remarked that flowers with more than one color turn out nicer. 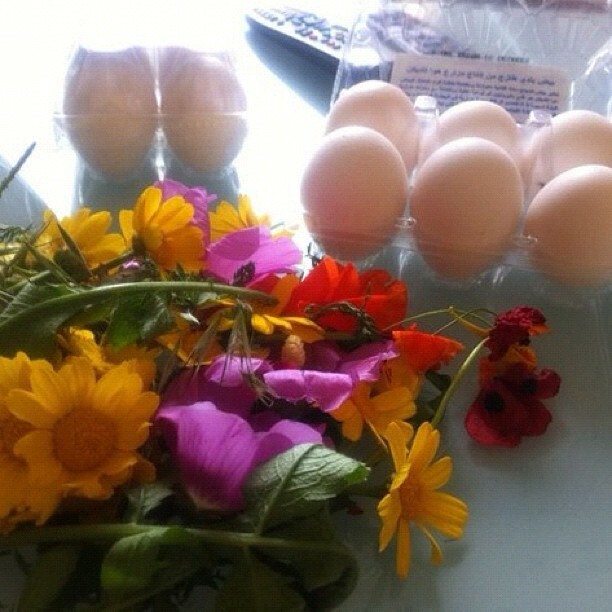 She also decided to keep the flowers embedded on the egg. Nadim’s mom mixed it up a little and decided to go for a combination of wildflower imprint and chemical coloring. Sarah (@safouzou) used wildflowers. Her eggs look great. dropped by for coffee this afternoon and she was like; I tried the “permanent hunger” egg coloring technique with the kids this morning! all in all it was a new and fun experience for the kids but most importantly my mum did something completely different on the very classic “easter friday” morning for the first time in 40 years. It’s a wonderful day of flow when someone decides to unexpectedly change an age old tradition. I’m glad I could bring that into your mothers life. Next up: Cleaning Jeans by putting them in the freezer. Now that’s a challenge!